There is no escaping the fact that over the last couple of decades, the rise in the number buy to let properties in Worthing has been nothing short of extraordinary. Many in the `left leaning` press have spoken of a broken nation, the fact many youngsters are unable to buy their first home with the rise of a new cohort of younger renters, whom have been daubed ‘Generation Rent` as landlords hoover up all the properties for their buy to let property empires. Government has been blamed in the past for giving landlords an unfair advantage with the tax system. It is also true many of my fellow professionals have done nothing to shower themselves in glory with some suspect, if not on some rare occasions, downright dubious practices. Yet has criticism of some landlords in Worthing gone too far? It was only a few weeks ago, I read an article in a newspaper about one landlord who had decided to sell their modest buy to let portfolio for a combination of reasons, one of which being the new tax rules on buy to let that were introduced last year. The comments section of the newspaper and the associated social media posts were pure hate, and certainly not deserved. Like all aspects in life, there are always good and bad landlords, just like there are good and bad letting agents and so it should be said, there are good tenants and bad tenants. Bad letting agents and bad landlords should be routed out but not at the expense of the vast majority who are good and decent. But are the 3,628 buy to let landlords in Worthing at fault? The Tories allowed people to buy their own Council house in the 1980`s, taking them out of the collective pot of social rented houses for future generations to rent. Landlords have been vilified by many, as it has been suggested by some they have an unhealthy and ravenous greed to make cash and profit at the expense of poor renters, unable to buy their first home. Yet, looking beyond the headline grabbing press, this is in fact ‘fake news`. There are seven elements that created the perfect storm for private renting to explode in the 2000`s. To start with, the Housing Acts of 1988 and 1996 gave buy to let landlords the right to remove tenants after six months, without the need for fault. The 1996 Act, and its changes, meant banks and building societies could start to lend on buy to let properties, knowing if the mortgage payments weren`t kept up to date, the property could be repossessed without the issue of sitting tenants being in the property for many years (even decades!). So, in 1997 buy to let mortgages were born and this, my friends, is where the problem started. Secondly, in the early 2000`s, those same building societies and banks were relaxing their lending criteria, with self-certification (i.e. you did not need to prove your income), mortgages 8 times your annual salary, and interest only mortgage deals that helped to keep repayments low. Thirdly, the totally inadequate building of Council Houses (Local Authority Housing) in the last two decades and, so I`m not accused of Tory bashing, can you believe Labour only built 6,510 Council Houses in the WHOLE OF THE UK between 1997 and 2010? Giving the Tories their due, they have built 20,840 Council Houses since they came to power in 2010 (although still woefully low when compared the number of Council Houses built in the 1960`s and 1970`s when we were building on average 142,000 Council Houses per year nationally). This meant people who would have normally rented from the Council, had no Council House to rent (because they had been bought), so they rented privately. 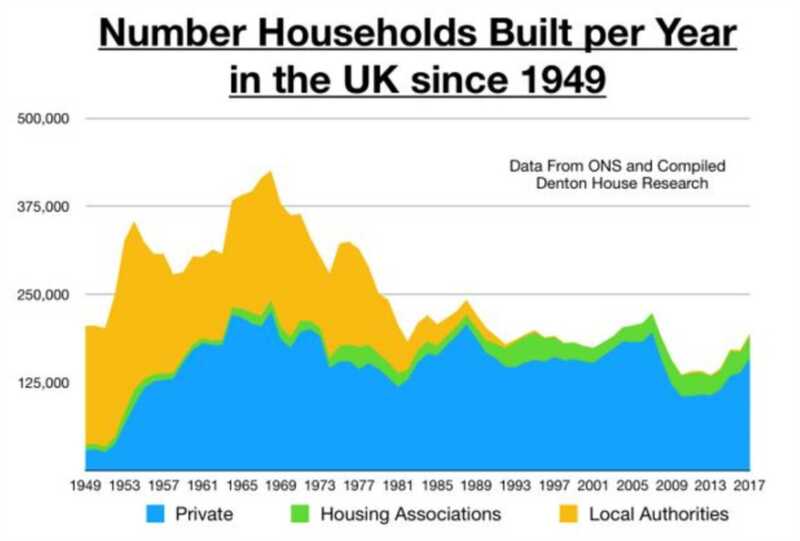 Fourth - Less private home building (again look at the graph) over the last two decades. Fifth - A loss of conviction in personal pensions meaning people were looking for a better place to invest their savings for retirement. Sixth - Ultra-low interest rates for the last nine years since the Credit Crunch meaning borrowing was cheap. Seventh - A massive increase in EU migration from 2004, when we had eight Eastern European countries join the EU. That brought 1.4m people to the UK for work from those countries and they needed somewhere to live. There we have it - the perfect storm conditions for an eruption in the Private Rented Sector. Commercially speaking, purchasing a property in Worthing has, undoubtedly been, the best thing anyone could have done with their hard-earned savings since 1998 because property values have risen by 278.29%. Based on the average rent in Worthing you`d have earned £382,104 in rent over this same period. However, the younger generation have lost out because they are now incapable of getting on the property ladder (especially in Central London). The Government have over the last few years started to redress the imbalance, increasing taxes for landlords, together with the Banks being tighter on their lending criteria meaning the heady days of the Noughties are long gone for Worthing landlords. In the past 20 years, anything but everything made money in property and it was easy as falling off a log to make money in buy to let – but not anymore. Being a letting agent has evolved from being a glorified rent collector to a trusted advisor giving specific portfolio strategy planning on each landlord`s buy to let portfolio. Depending on where a landlord is on their buy-to-let journey can alter what they need. For example, some properties are better for generating an income whilst some offer greater capital growth. As agents we must also keep up-to-date with the constantly evolving legislations. From 1st October landlords who operate Houses in Multiple Occupation (HMOs) must apply to their local authority for a licence, a change that the Residential Landlord Association estimate will affect 177,000 landlords nationwide. If you think you need ‘portfolio strategy planning` or are concerned about how changes to the law may affect you then, whether you are a landlord of mine or not, send me an email or give the office a call.